#pressonblog | Testimonies about the Holy Spirit. Ministry, Life and Family. Timeline of Events and Personal Encounter with Jesus Christ. Last night I went to the graduation of New Life Training Center – Sta. Rosa Batch 10 they had a play/skit which I am excited telling you about the conclusion of their local and foreign missions. During the 9-month training they had two local missions in Catbalogan and Davao (which we become a part of). Their foreign missions was in Laos 🇱🇦 and Thailand 🇹🇭 I wish I could show you the footage but for the safety of our missionaries living abroad I would rather tell you the story. They went to Laos March 13 and Arrived home March 20. The team leaders’ story was Filipinos in Laos were well respected and have a huge impact in their nation who then become part of their history. Wow I’m proud to be Filipino! They contributed in their society by becoming teachers of english language primarily. They bring the gospel through education. Children and adults are being reached. These missionaries have given their lives for the sake of the gospel regardless of getting paid or not. The team ministered to a church, people, and children. I believe in the prophecy that we are not anymore in the time that God will raise up another famous preachers but God will raise up His body, ordinary believers, the church itself to do great exploits! My prayer is that we become intentional to come before God by allowing Him to use us… Not only through our giving but becoming intentional reaching the people, rich or poor and preach the gospel to them, pray healing for them, give exhortation to the weak, express the love of God, and whatever you think of… It all comes down to one Person our need to have Jesus in our lives and leading people to Christ. I want to challenge you to sign up and move in evangelism go to your pastors or small group leader and ask them how you can share the gospel to people. Thank you all so much for your continued support in the ministry the Lord has started in my life and for supporting the ministries of people I believe into. Thankful for NLTC Batch 10 for allowing us to partner and to my Senior Pastors who allowed me to do the campaign. I didn’t have the money to support but it was really the desire of my heart to support missionaries who are planted in a local church where I believe rich in spiritual gifts and fruits of the Spirit. I don’t want to yield in the limitation I have because after every encounter I have with God I receive word of wisdom coming from Him, that’s why this campaign became a success. All the glory to God alone. It was never in my heart to go to all the nations, my thoughts and the desires were only for CALABARZON and the Philippines but I was rebuked by God through preachings that God didn’t want us to reach only Jerusalem but also, Judea, Samaria, and the ends of the earth (Acts 1:8). I’m believing God to join the foreign mission next year 2019 I am hoping for your continued support. We will go to Dubai! Thank you so much! So blessed because of you. Thank you for allowing the grace of God to get activated in your life. Dear Partners, the Lord has just started, where only in the mid of this year. There will be breakthroughs as it breakthrough it will accelerate and you will praise God for it. I encourage you to PRESS IN in your prayers, don’t let go of it as long as it is in line with the word of God. Firevolution is the yearly event of New Life Sta. Rosa I started attending since 2014 and now it’s my fourth year attending this revival meeting. This is a three-day event and I made it sure this year I would bring family, friends, and neighbors to experience what Firevolution is about. My mother, cousins, a friend, and a neighbor joined. I remember as the event started its first night during worship, God reminded me how He transitioned my life. God showed me two pictures one was I was blowing cigarette smoke and drinking alcohol those late nights that I was so depressed that I had to drink so I can sleep. The other picture was God used my mouth to preach salvation, healings, and miracles. The guest speaker started to teach and preach and he mentioned that when every time we speak the gospel there is firepower comes out of our mouth. That’s exactly what the Lord showed me. NOV 2: The second day, my cousin and friend joined us both of them never received the baptism of the Holy Spirit with the evidence of speaking in tongues yet. 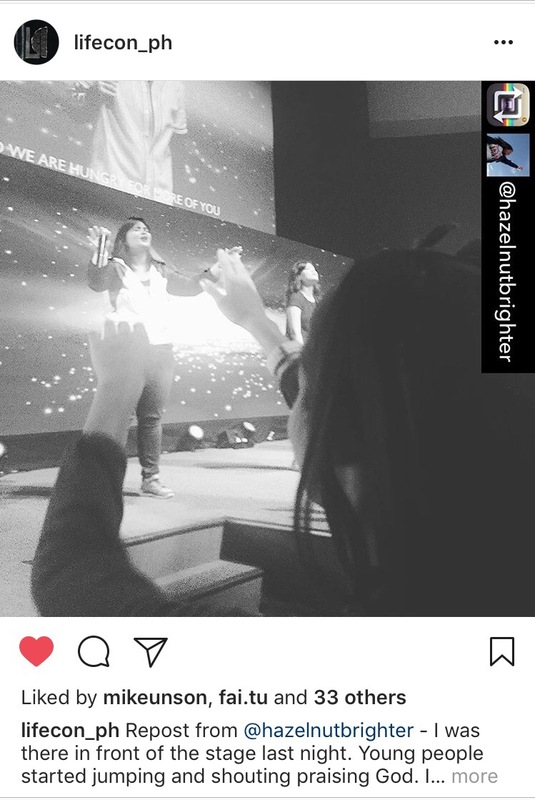 I was blessed by the testimony of my friend Beth, she’s been a Christian since she was a child and it’s the first time that she got filled with the Holy Ghost and spoke in tongues and she told me that doesn’t know what to do to stop it because she was the last to get up from the floor after me. I was also filled with the wine of the Holy Ghost and could not stop laughing! Let me clear that up, the Holy Spirit is a perfect Gentleman He will not insist Himself to a person. The service ended at 11:30 pm and we got home by 12:30 am and we ate, and then we prayed. I encouraged Beth to use the gift of speaking in tongues she thought she lost it and was afraid why she couldn’t do it then eventually she spoke in tongues and we finished praying 2:30 in the morning. I was blessed to see her having an encounter with God to hear her testimonies. NOV 3: The third night, I was asked to volunteer for the counselling this evening but I ended up to be a catcher to some people during the ministerial. But when Rev. George Thomas asked everyone standing to sit on the floor I went to the carpet in front of the stage. I was sitting at first and I laid down eventually and was filled by the Holy Ghost anointing to the overflowing. There’s so much anointing coming out from the sound of the drums that I believed I got delivered from something. My head was shaking from side to side, up and down, my feet and hands are paddling like I was swimming in the presence of God. There was a point that I felt like I was light as a feather where in reality I am 200 plus pounds, I get up and crawled I was attempting to run, our neighbor saw me and she said I stood up as fast as a lightning. This is what happened, I was so full of the Holy Ghost I felt very light and God took my hand and He was pulling me up to the heaven and then I tried to open my eyes it was dark and I shouted “God… God…” and the ushers stopped me. Thank God they stopped me because I would run over the people in the people on the floor if they didn’t. Clap clap to the ushers! I was in the state the I was so full of the joy the Lord I was so high under His presence and I couldn’t explain how it felt like it’s unexplainable. All I know is that I want to stay in that kind of presence for the rest of my life. I was full of the Holy Spirit and yet I wanted more and we’re all surprised that our senior pastor announced that Firevolution is extended for another week for the first time, from November 7 to 10, 2017 at 7:00 pm. I will try to reach out to some of my friends and invite them. Hallelujah! God does not want us to get stuck long enough in our journey to see breakthroughs in our lives He wanted us to take His word and have it as our possession. His word will take us to the inheritance which He promised. Ask yourself… What is my promised land? What is it that God wants me to possess? What is my Canaan? People are different individuals and with different needs but it all sums up to one thing. Man wanted a prospered life regardless of its motives. I asked God this morning, God, how do I become obedient to You? I don’t want to confuse my obedience to the Lordship of Jesus Christ. God reveals me that His grace enables me to submit to His commands and His commands point me to His Grace so that I may obey. We cannot go up in a fight on our own we need God in the center of everything we do from smaller to greater things. We don’t want to wander many years like the Israelites because of disobedience. What I observed despite their disobedience God’s favor is upon them and they did not lack. I believe along the way God showed the Israelites the lands which He gave to the descendants of Esau and descendants of Lot. They were afraid of them Deut. 2:4. I believe Israelites have stronger armies both descendants of Esau and Lot are afraid of them. The difference with Israelites is both Esau and Lot fought against giants before they possessed their land and the Lord destroyed their enemies. God was about to do the same with Israel to fight with them but Israel relied on their own strength and become afraid to possess the land and accused God that He will destroy them Deut. 1:26-28. 20 (That was also regarded as a land of giants;[a] giants formerly dwelt there. But the Ammonites call them Zamzummim, 21 a people as great and numerous and tall as the Anakim. But the Lord destroyed them before them, and they dispossessed them and dwelt in their place, 22 just as He had done for the descendants of Esau, who dwelt in Seir, when He destroyed the Horites from before them. They dispossessed them and dwelt in their place, even to this day. Despite Israel’s rebellion, He is gracious and merciful He blessed and prospered the Israelites to sufficiently provide for their food. He is a loving God and man has to realize that God is not playing games with men. We all go through seasons in our life that seems wandering in the wilderness but as we humble our selves to God and repent of our sins He is willing to forgive us, we might suffer consequences from our sins but as we acknowledge the Lord our God He is going to lead us, bless us and fight for us. God’s children have to make sure that they are on the right track with God or missed another opportunity to enter into the right timing to possess what God has promised. We should fully rely on God and walk in faith. When things don’t feel right or look right but when the Lord said Go we are ready to walk in that promise and He will destroy the enemies before us and if the case becomes too hard for us along the way He said to bring Him and He will hear. “These young people that step in to the altar call I gave them a heart to serve me in full time ministry. These young people are not only fired up when the music is up, they are also hungry and thirsty to hear from me, to listen actively when a preacher delivers my word. They are going to shake the nations. They are going to shake their generation and your generation. All generation I will use them to shake them to come to Me “the Desire of all nations”. Then, I won’t stop crying in the middle of the crowd jumping, running from side to side. I found worship in the midst of praise and anointing was all over me, I cried and cried because the Lord is good. There’s so much love in His manifest presence that enveloped me. He is good! God is gonna’ bring influence to these young people so that the lost may be saved! Amen.